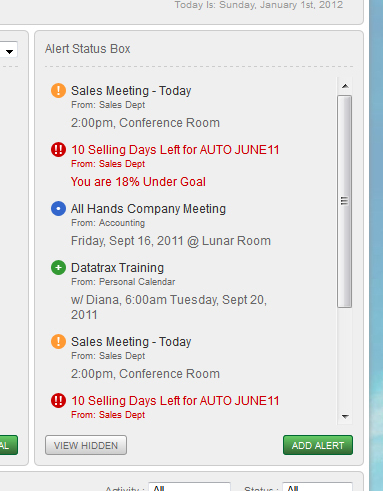 See your actual sales stats versus your budget and forecast within the time frame of your choosing. 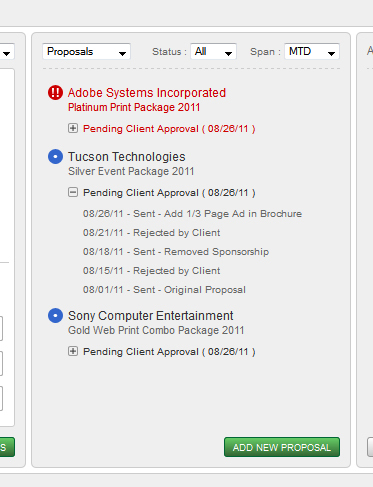 You can also subdivide the information by property and media type to get the precise information you're interested in. Need to move some numbers around? 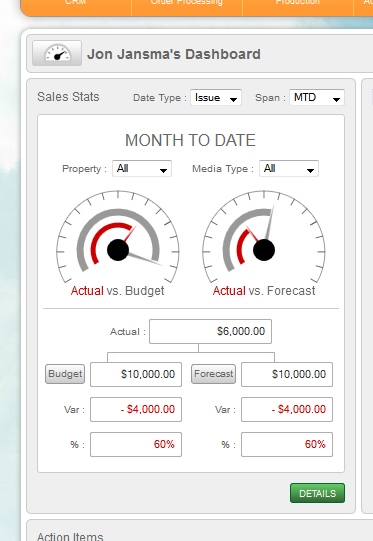 Editing your budget and forecast is always a click away. You can always be a step ahead of the game when you know the next move. The Proposals and Contracts section lets you see where your active proposals and contracts in process, and brings a proposal or contract to your attention when it needs your attention. Never again will an important contract or proposal go forgotten! It's a good feeling to know what your day consists of. 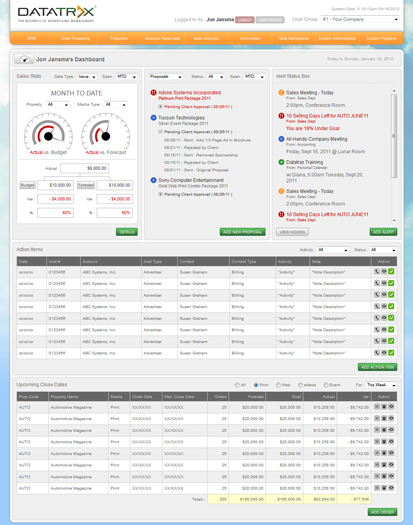 Since our Alert Status Box is located right on your new dashboard, you'll always know what to expect from your day when you open Datatrax® in the morning. The Action Items List displays accounts that you may need to follow up with either today, or relatively soon. Have a hard time remembering what issues are closing soon? Well, kiss those days goodbye! Our Upcoming Close Dates List keeps you in-the-loop at all times. Now you can instantly know which issues are closing and when. It also displays the sales numbers per closing issue so you can easily tell if you need to put together any more sales for that issue.